A day off the bikes, Hurrah! Today we boarded our very own Junk boat to cruise Ha Long bay. I’m not joking about that either, a boat capable of easily carrying 30 or more people had just Gemma and I, our guide Hoang and the crew . Ridiculous.Ha Long bay must be experienced to understand its size. Most people have probably seen it on a travel show at some point but the quantity of islands is hard to believe. 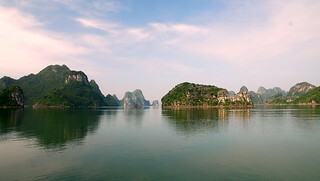 The entire area that encompasses Ha Long bay is over 1500 square kilometres and contains about 2000 limestone islands jutting out from the sea. The main area of the bay is just over 330 square kilometers with 775 islands. The name, Ha Long, translates to “Descending Dragon” and comes from an old legend where dragons were sent to protect the vietnamese from invaders. The dragons spat out jewels which turned into the islands and formed a fortress around the bay. Without anyone else to worry about, the ship and its trajectory were ours to command. First stop, a quick kayak around some of the islands and through a few caves. Then onto Sung Sot Cave, or Surprise Cave. The french named this cave on one of the islands as each of its 3 caverns becomes surprisingly larger. The last almost the size of a football field. From the caves it was back on the boat for lunch and then a short stop fo dive from the junk and a swim in the bay before arriving at our destination, Cat Ba Island. Cat Ba is one of only a few islands with human inhabitants. Tomorrow we will cycle around the island but with no support van (Tu is still on the mainland) it will be all up to us. Simon this video is just crying out for a soundtrack commentary. I don’t mean you two singing in the background but the whispering style used by golf and snooker callers “and as we glide peacefully through this limestone arch a peaceful panorama opens up before us and we rest our paddles, to quietly contemplate this, the most restful spot we have found in Vietnam”. I believe that Gemma could do a passable David Attenborough while you could chime in as the expert commentator a la Tubby Taylor. You two are tough to please. If only we had the time of a retiree and Rod’s gift of the gab.